Product information "embollishing wax set"
This new sample set of waxes are perfect for Christmas presents! I get asked a lot for sample pots, so I’ve bent to user demand! This set comes with 30g each of the seven embellishing waxes and 30g of the best selling High Gloss Finishing Wax. 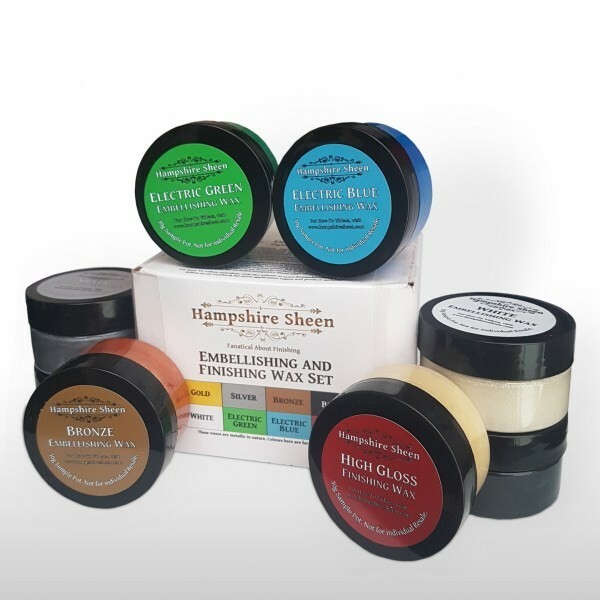 Hampshire Sheen embellishing waxes are ideal for enhancing open grained decorative items from woods such as Oak or Ash or woods with added texture. They work brilliantly in combination with the Intrinsic Colour Collection and this set of 7 waxes is perfect for experimenting with. Included in this set are seven 30g pots of embellishing waxes and a 30g sample of High Gloss Finishing Wax to use as an overcoat. Used appropriately, each pot should embellish at least three 8” ash bowls with the wax rubbed into the grain. Related links to "embollishing wax set"
Customer evaluation for "embollishing wax set"